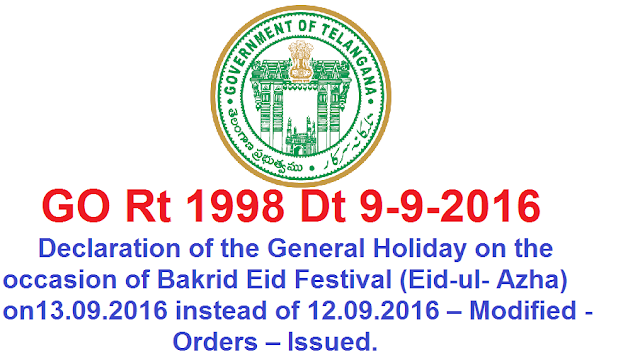 GO Rt 1998 Bakrid on 13.09.2016 instead of 12.09.2016- Orders issued HOLIDAYS – Declaration of the General Holiday on the occasion of Bakrid Eid Festival (Eid-ul-Azha) on 13.09.2016 instead of 12.09.2016 – Modified - Orders – Issued. In the G.O. 1st read above, Government have issued orders declaring 12.09.2016 (Monday) as General Holiday on the occasion of Bakrid Eid Festival (Eid-ul-Azha). 2) In the reference 2nd read above, the Chief Executive Officer, Telangana State Wakf Board, Hyderabad, has recommended to declare the General Holiday on the occasion of Bakrid Eid Festival (Eid-ul-Azha) on 13.09.2016 instead of 12.09.2016, as per sighting of the moon. In partial modification of the orders issued in G.O.Rt.No.3192, G.A. 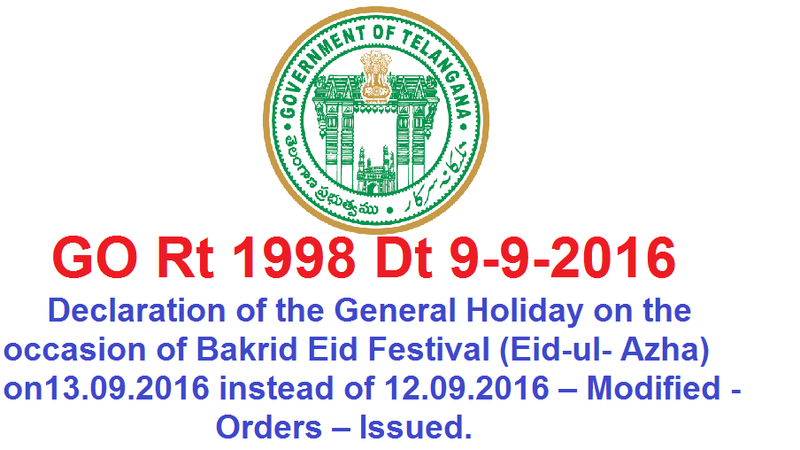 (Poll.A) Dept., dt.05.12.2015, notifying the General Holidays and Optional Holidays, the Government hereby declare 13.09.2016 (Tuesday) as General Holiday on the occasion of ‘Bakrid Eid Festival (Eid-ul-Azha), instead of 12.09.2016 (Monday), declared earlier.